The eldest daughter of Dimiter and Elena (Mandieva) Stephanov was Katerina, whose birth in the village of Bansko, Macedonia occurred between 1868  and 1870  although one source shows 1871, and two others show the year of her birth as 1873. Her birthdate appears to have been April 23rd. According to a memoir she composed late in life, some of her earliest memories were of the events surrounding what was later termed the 1878-1879 Kresna-Razlog Uprising, a valiant, but failed attempt of Macedonians to throw off the yoke of Turkish occupation. This effort that had been successfully achieved by their Bulgarian kinsmen during the Russo-Turkish War of 1877-1878, but Macedonia remained under Turkish rule for another three decades. 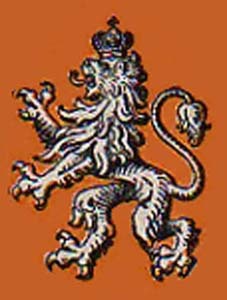 The occupation of Bulgaria by the Russians and the treaty of San Stefano did not end the woes of Bulgarians. Macedonia was to have its share of suffering. 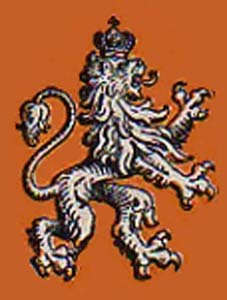 Restless spirits in many places were ready for any thing that gave hope of freedom, and bands of adventurers, some of whom were daring mountain brigands, incited and aided, it is said, by foreign influence and money, were ready to light the torch. Such a band entered the Razlog district, during the fall of 1878, and took possession of Bansko, its largest town, and from sympathy or fear, were joined by a considerable number of inhabitants who, from behind the heavy walls about the surrounding gardens and fields, were able to defend the place against all the available forces which could be sent against them from the government headquarters at Mehomia. The insurgents were however shortsighted in their plans. A strong body of regular troops soon arrived from Nevrokop, on the south and surrounded the village of Banya. Many of the Bulgarian inhabitants of this place went out to oppose them but were quickly overpowered and soon their homes were in flames. Men, women, and children left all, and, with little but the clothing upon them at the time of the attack, fled to the mountains pursued and cut down by the troops. A large part of the Bulgarian dwellings were consumed. From their higher locality the people of Bansko saw the fight, the flight, and the flames. They had no hope of successfully contending with regular troops and they too fled. Some went to the lofty Pirin mountains whose base is close to the town, but the larger part took the paths leading through the valleys and over the mountains to the N.W. toward Djumaya. All night long many feeble and weary ones, walking and then resting, pressed on to reach a place of safety. Some were two or three days in going a distance of nine hours. In one of the wooded valleys the mountain robbers fired a few shots toward the fugitives calling out "The Turks, the Turks." Consternation seized the refugees. They threw away the clothing and valuables which they had taken for the flight, for life was dearer than all else. Mothers even threw away their infant children, some of whom were crushed to death by the iron hoofs of the horses which were being urged on by their frightened owners. Many villages and hamlets to the S. W. of Bansko were involved in this uprising, and their inhabitants also fled to Djumaya. Mr. Palgrave, the English Consul in Sophia, visited this place soon after the flight and reported to us that over 10,000 fugitives had come in to Djumaya, of whom about 4000 remained in the town and surrounding hamlets. The others scattered to different parts of Bulgaria but were most numerous in Dubnitsa and the nearer places. Among these fugitives were a large part of the members and congregation of the Evangelical church in Bansko, the largest of all the Bulgarian Evangelical churches. Mr. Palgrave urged us to do what was in our power for the relief of the refugees who must suffer much during the severe cold of winter. Cornell University Alumni Association Questionnaire, completed 28 May 1933, by Skender Gregor Tzilka; copy in possession of Dr. Richard M. Cochran, Big Rapids, MI. Marriage Record #8775, Gregory M. Tsilka to Katherine Demeter Stephanova, (1900) issued by Bureau of Records, County of New York, State of New York. 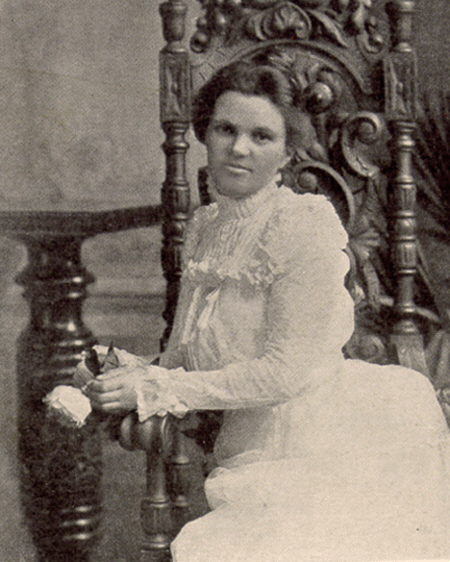 This record was signed by Katerina, and states she was then 30 years old (born 1870). 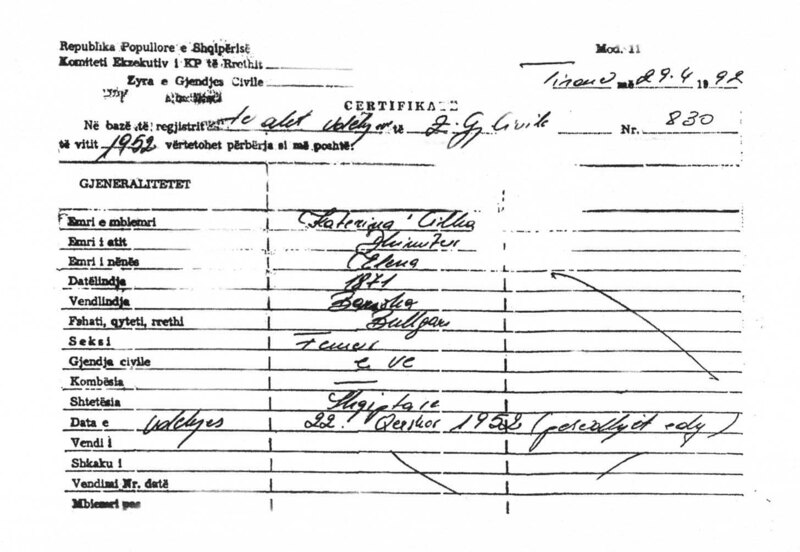 Death Certificate #830, Katerina Cilka, (1952) issued by the Albanian Bureau of Vital Statistics, Tirana, certificate issued 29 Jun 1992; copy in possession of Dr. Richard M. Cochran, Big Rapids, Michigan. This record lists her birth year as 1871. 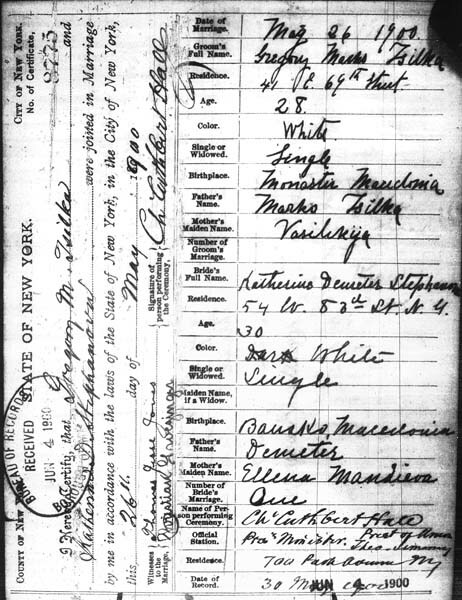 The 1900 U.S. Census, 54 Eighty-Third St., Borough of Manhattan, New York Co., New York, ED 513, Sup Dist 1, Sheet 16b, 9 Jun 1900; digital copy seen on ancestry.com [82/212 Stephanove, Kate, boarder, b. --- 1873, 27 years old, single, b. Turkey/Turkey/ Turkey; immigrated to America 1892; nurse] Note: Katerina was among 18 boarders with Miss Aliza[s] Lapham, b. Apr 1847 NY/NY/Canada; one of the other boarders was Lucy Ryder, b. 1875 VT/VT/VT who is mentioned in some of the correspondence following her abduction. Katerina is also listed as born in 1873 in the passenger list of the ship that transported her and her family to America in 1903: Manifest of Passengers on the S.S. Patricia, sailed from Cuxhaven, April 4, 1903 and arrived at New York on April 16, 1903; printed page 50, line 25. Available at ellisislandrecords.org and ancestry.com.